Most B2B companies are pursuing Inbound Marketing and finding that it’s not bringing in the leads that they had hoped. It’s not that inbound marketing is broken. It’s because they’re not executing it in a cohesive way. What we are seeing far too often out there is that B2B marketers don’t really have an underlying strategy. They are conducting their digital marketing in a more incremental, non-holistic way. This is very inefficient because it creates a lot of redundancies in the effort that is involved to setup each strategy and it also makes things harder to manage and measure on an ongoing basis. The key to success is having a way to get everything working together to support a central strategy. 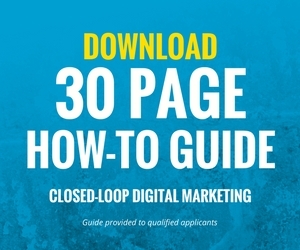 Do you have a documented strategy that guides all of your digital marketing efforts? Are you tracking Key Performance Indicators for all channels and campaigns? Is your team clear about what the goals are and are they being held accountable for executing the strategy that supports those goals?? Is your boss aligned with your goals and are you able to provide regular status updates about the Key Performance Indicators? Have you stuck with a strategy long enough to realistically measure its effectiveness?